Slade Alive! is Slade's first live album, released by Polydor on 24 March 1972 and produced by Chas Chandler. It reached No. 2 in the UK and remained on the chart for 58 weeks. It was Slade's first album to enter the UK charts and also the first to enter the Billboard 200 in the United States, where it reached No. 158. Slade Alive! contains three original songs, plus cover versions of songs by Ten Years After, The Lovin' Spoonful, Bobby Marchan, and Steppenwolf. It was recorded live at Command Theatre Studio and mixed at Olympic Studios. Today, the album has been considered as one of the greatest live albums of all time. Kiss, who were heavily influenced by Slade, would title their 1975 live album Alive! as a homage to Slade Alive!. Having made their UK breakthrough with the successful singles "Get Down and Get With It", "Coz I Luv You" and "Look Wot You Dun", Slade decided that the best way to break into the album charts would be to capture their live sound on record. Shortly prior to the album's recording, Hill said: "If this live album works then it will set a pattern for us and we'll probably repeat it. We're trying to discover something for ourselves. We want to find out what is right for us as a group. We'll soon know." He told Record Mirror: "Fans come up and ask if we have an album out and it's a bit sad that there is only Play It Loud because it is so dated. We should have recorded a live album ages ago." In October 1971, the band played three consecutive nights at London's Command Theatre Studio in front of a studio audience. The three nights cost £600 to record, with the band using most of their recorded performance from the second night. Initially Chas Chandler rejected Command Studio's mix of the album, which was completed in conjunction with the band themselves. He then proceeded to remix the tapes himself, but the band then rejected that mix and went back to their own original mix. Prior to the album's release, "Hear Me Calling" was released as a promotional single in February 1972, with "Get Down With It" as the B-Side. The release was limited to 500 copies. Slade Alive! was then released without overdubs in March 1972. It was a big success in the UK where it would reach No. 2. In Australia, where it reached No. 1, it was the biggest selling album since The Beatles' 1967 album Sgt. Pepper's Lonely Hearts Club Band. In its original LP vinyl format, the album was issued in a gatefold sleeve which revealed a huge cartoon drawing on the inside. This drawing was the winning entry in a competition run in The Sun newspaper to design the album cover. In Israel and Italy, the front cover used the inner gatefold artwork instead, whilst certain editions releases in the Netherlands and France also used this design. In 1978, the album was given a German release as a double-pack LP with a gatefold sleeve, paired with the Slade Alive, Vol. 2. It received its first CD release in 1991, which was digitally remastered by Lea. In 2006, it was included as part of the Salvo two-disc live compilation Slade Alive! – The Live Anthology. Salvo re-issued it on vinyl in 2009 and on CD in 2011. In 2017, BMG released a deluxe edition to celebrate its 45th anniversary. It was issued on vinyl with a 6 page insert and art card, and on CD with a 28 page booklet. As a major part of promotion for the album, the band embarked on a UK tour during April and May. The poster for this tour used the same artwork as the album, both front and back sides. On the UK Granada Television, the band performed a 'Set of Six' show on 13 June 1972. This filmed set featured a similar set to Slade Alive!, the tracks in order being "Hear Me Calling", "Look Wot You Dun", "Darling Be Home Soon", "Coz I Luv You", "Get Down and Get With It" and "Born to Be Wild". Speaking of the album's commercial success prior to their UK tour, Hill told Pamela Holman of Record Mirror in 1972: "We were amazed that it got in [the charts] so quickly. The real promotion on the album hasn't even got going yet. This tour we start on May 10 is the main promotion because the album is live and we sell it on our stage show." Record Mirror reviewed the album and stated: "This is a good quality live recording. To those who haven't seen Slade this could be surprising, with Noddy's raucous vocal, and bellowed comment - and make their appeal difficult to understand. It's a rocking album and the excitement of the group and crowd has been captured well, but it's not easy listening, somewhat frenzied! On stage the group hold attention with their cavorting antics and general enthusiasm, and to followers this is good album to keep remind of the live performance they'll see." New Musical Express said: "Slade Alive! is just what it implies, having been recorded before a rowdy crowd of fans at Command Studios. If you've ever been to one of their noisy gigs, you'll know exactly what I mean." The album would later be rated No. 2 in the magazine's Top 10 albums of 1972. Melody Maker commented: "Because it was recorded in a studio proper, before an audience, they've achieved the kind of balance and sound not often heard on a live recording." Daily Mirror said: "Ok, so they're rough, they're noisy, they sound like a football crowd on a boozy night out. But when they play "live", baby they're alive and kicking. The album keeps them that way." Gregor Vaule of Colorado Springs Gazette-Telegraph said: "Slade rank with folk like T. Rex in England both as hit makers and as concert attractions; and they have crammed much of their famous in-person excitement into their U.S. debut album Slade Alive! Slade's music is about as low down nasty as a four man rock band can make it. The LP thunders in on Alvin Lee's "Hear Me Calling" and from that point on there is never a dull moment." Mike Diana of Daily Press Newport News commented: "The boys play a frenetic kind of rock 'n' roll that features screaming lyrics, monosimple rhythms and buzzing guitars. No mistake about it... it seems to be just what is a lot of nervous energy to be burned there. The album, Slade Alive, is a real toe tapper and guarantees one hands a clapping." Billboard wrote: "Slade rank with T. Rex in England as hit makers and concert attractions, and they convey much of their in-person excitement on their U.S. debut LP. A rock band in the old fashioned sense, Slade set an aura of tension from the opening "Hear Me Calling" to the "Born to Be Wild" finale, showing equal skill on the melodic "Darling Be Home Soon." This could be the set that will open the U.S. market for them." Robert Hilburn of the Los Angeles Times said: "Granted there is a rather shameless quality of imitation and downright thievery in much of Slade's music, but there is also, joyously, some of the most potent, irresistible rock 'n' roll to cross your turntable this year. In fact, you have to go back to the best moments of Exile on Main Street, to find anything quite so spirited. There's nothing really innovative or complex or mysterious about the band's music, but there's such a forceful, celebrative nature to Slade that I would cancel anything else that dared be on my schedule the night the group comes to town for its next concert here. As with any band worth its rock 'n' roll shoes, Slade Alive sounds better the louder you play it." Rich Aregood of the Philadelphia Daily News described the album as "eminently enjoyable" and commented: "...Slade is something else again. A loud, rude, and exciting flatout rock-and-roll band that could even get Pat Nixon tapping her toe. She might get up and dance, in fact. These guys can really get it going. They have lapses in taste, but that's part of their appeal." American music industry trade magazine Record World picked the album as an "album pick" and commented: "Superhot British group should soon be equally popular in this country. Highlights of this live album include Alvin Lee's "Hear Me Calling" and, surprisingly enough, John Sebastian's "Darling Be Home Soon". High energy." In 1991, Q wrote: "Slade Alive! revealed their desire to rock out, with a distinctly heavy seven-track selection. The laddish rock style is in evidence, most notably on a fairly faithful rendition of The Lovin' Spoonfuls' "Darlin' Be Home Soon": a gentle ballad which vocalist Noddy Holder colours by belching during the moody middle eight. That burp kind of sums up the Slade ethic which was emerging on Slade Alive!. It's just fun and beers all the way." In 2010, Classic Rock considered the album "superior: reputation cementing" and wrote: "Released nervously after two studio albums that had flopped, Slade Alive! was the live record that saved Slade's bacon. Completely devoid of any overdubs, this distillation of Slade's live show of the time took them to #2 in the UK chart." AllMusic commented: "Slade showed why they were one of England's best live acts with this fevered concert recording from 1972. 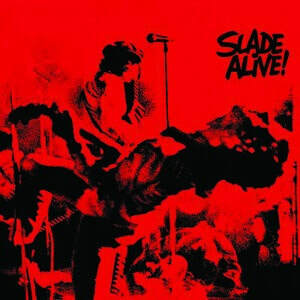 Set alight by plenty of stomping beats, lumbering bass, fat guitars, and Noddy Holder's hoarse vocal scream, Slade Alive! finds the lads from Wolverhampton goading on their rabid fans at every juncture." "Hear Me Calling" is a cover of the 1969 song by Ten Years After. Slade covered the song frequently live and it was the band's show opener for many years. In a 2011 interview on the Radcliffe & Maconie Show, lead vocalist Noddy Holder stated that while on tour in America with Ten Years After, the song's writer, Alvin Lee, had told Slade that their version had made him more money than the Ten Years After original ever did. Originally, Slade had planned to record the song in the studio as a potential follow-up to their 1971 breakthrough hit "Get Down and Get With It". However, the band couldn't better the song in the studio. In 2011, the vinyl acetate containing the studio version appeared as a bonus track on the 2011 Salvo remaster of Sladest. "In Like a Shot from My Gun", an original, was also briefly considered for a studio recording, but the live version rendered the exercise pointless. In a 1981 interview, drummer Don Powell said: "It was originally meant to be put down in the studio. But after we recorded it live for the Slade Alive! album, we didn't think that we could do it any more justice by doing it in the studio - as it's basically a live number." "Darling Be Home Soon" is a cover of the 1967 song by The Lovin' Spoonful. The song notably features Holder burping into the microphone. In 2000, he admitted on The Frank Skinner Show that the burp was accidental as the band had a lot to drink before performing. Holder also stated that from then on, he had to continue to do the burp whenever the song was performed otherwise the audience would be disappointed. "Know Who You Are" is an original song which originally appeared on the band's 1970 album Play It Loud. It also appeared on the 1969 Ambrose Slade Beginnings album (as an instrumental track, without vocals), at which point it was titled "Genesis". "Keep on Rocking", written by the entire band, was never recorded in the studio. The song is based on a classic rock 'n' roll sound, showing Slade's further inspiration from artists like Little Richard. "Get Down With It" is a cover of the 1965 Bobby Marchan song. Aside from being Slade's breakthrough hit, it was regularly featured as part of the band's live set for the band's entire live career. "Born to be Wild" was is a cover of the 1968 song by Steppenwolf. Slade had originally released a studio version on their 1969 debut Beginnings.